"Bread company owner takes the stand in defense"
"The defense has only one other witness [who is] expected to say that she ate Great Specialty bread and did not get sick." 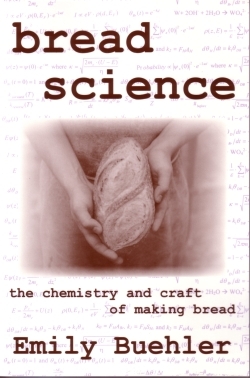 Also, some background at Celiac.com. Kroger sells a store-brand split bun that's bigger than a hot dog bun, but smaller than a hoagie-type roll. It's for things like bratwurst (not that I'd let the absence of a particular-sized roll keep me from eating a brat). I've been privately kvetching for a few years now about not having any Pullman pans. Pullman pans, with their square sides and lid, allow one to make a loaf with square slices for sandwiches (not that you can't make a sandwich out of a non-square piece of bread, but you know what I mean). 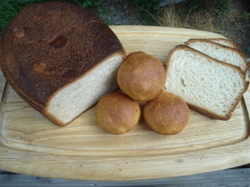 My kvetching level increased when I started doing JLMBBC bread, because I thought maybe a Pullman pan would seal well enough to let me use the JLMBBC technique with one. Alas, I never found one nearby within my price range. 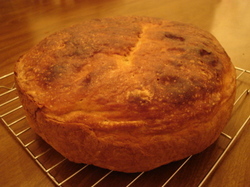 I mixed and kneaded the recipe. The volume for the Pullman pan she recommended was way more than the volume of one of my "footboule" pans, so when I got ready for my final shaping, I weighed out an amount proportional to my smaller-volume pan. I took the rest and shaped little balls for rolls, which I cooked first in a muffin tin. 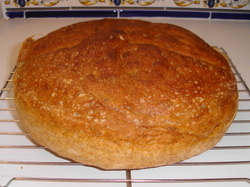 The bread came out fine. 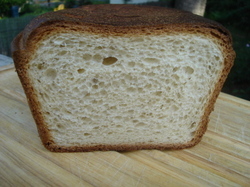 White sandwich bread has very little structure compared to other bread, so having a pan that's essentially a mold helps get you the loaf shape you want. 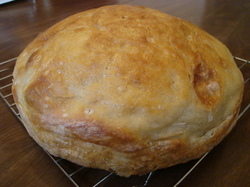 Also, having all sides pretty well cooked gives you a little more structure to hang the airy bread off of. As you can see, the footboule pan worked fine. 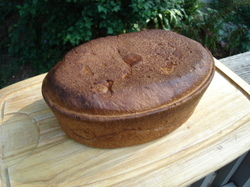 I oiled the pan and the inside of the lid, just as one would do with a Pullman pan. The directions called for the baking to be done half with the lid on, and half off. The loaf did want to hold on to the lid a bit, but it came off with only a little coaxing. 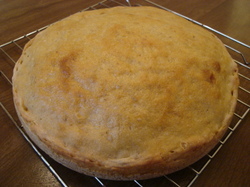 This bread, as intended, is much less dense than, say, the JLMBBC footboules I've been making. One of those usually weighs just under 1½ pounds. 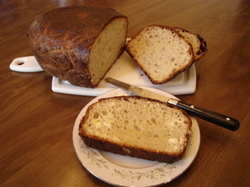 This loaf weighed about 18 ounces, or almost 6 ounces less. But it had maybe 50% more volume. 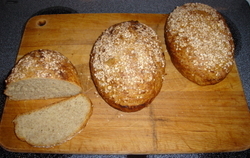 And as you can see from the picture on the right, the crumb is much more fine and even -- maybe not so much as a loaf of store-bought sandwich bread, but certainly nothing to be ashamed of. The thin-well done crust all around helps hold together the slices, whose crumb has not much more cohesiveness than a slice of cake. The taste: pretty good, and about what I wanted. 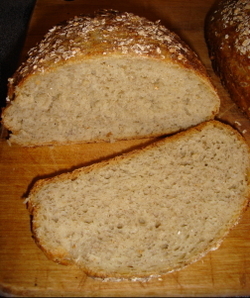 Milk, butter, and a little honey give the bread that barely sweet, tender taste I wanted out of white sandwich bread. There's also a pleasant, acidic note; I have no idea how it got there. 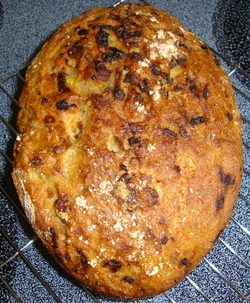 The bread toasts well, browning a little more quickly with the added honey. The honey also helps the loaf stay soft. By the way, there are Wikipedia pages for both "pain de mie" and "Pullman loaf," but they're both sub-par for Wikipedia articles. They do have smidgens of information I don't include above, so I've linked to them. 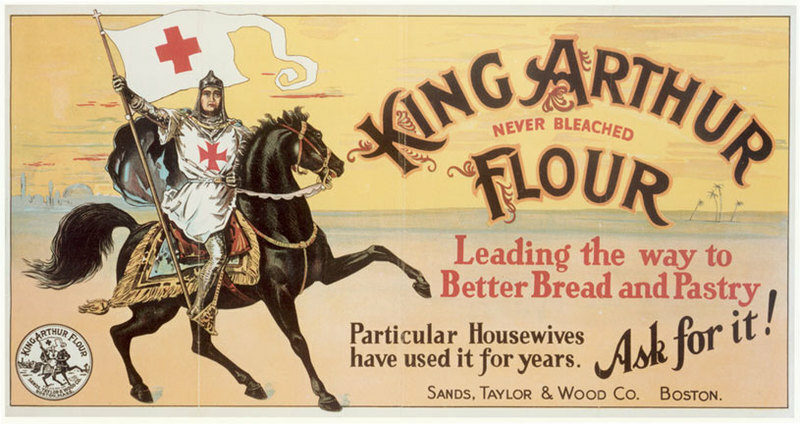 I Guess I'm a "Particular Housewife"
Edit: King Arthur has a good explanation up about why wheat prices, along with a lot of other agricultural commodities, are going through the roof. I think the only thing they leave off is mentioning that the price increases are partially driven by a move to growing more corn expressly for ethanol production for fuel.